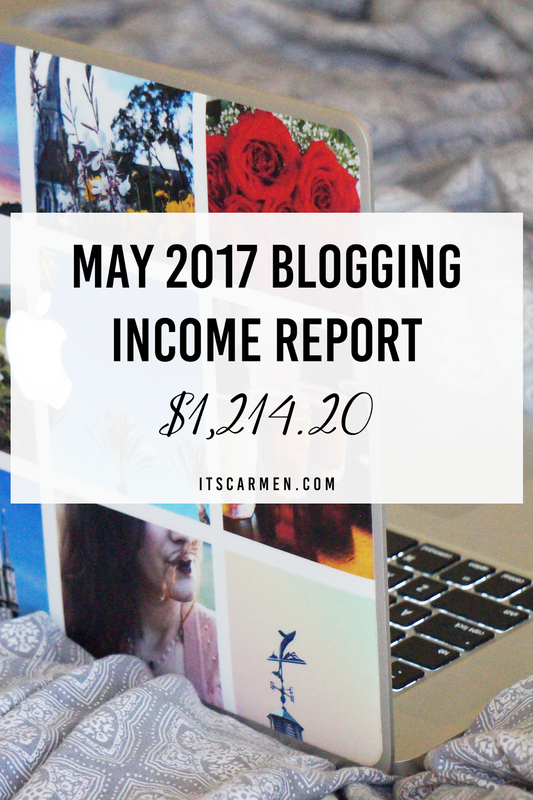 Hi friends & thanks for checking in on my Blogging Income Report. I finally hit the $1,000 mark! Crazy to think I've been writing these since January when my income was just about $450. I've been able to increase my earnings this month thanks to adjusting some of my coaching practices & earning more from sponsored posts. Take a look at my income, expenses, & net total. I also get delve deeper into each income category. Read on, my friend! * Disclaimer: This post contains affiliate links. Note: I base my income report on earnings that were deposited into my bank account during that month. I did a couple projects in May that have yet to be paid out, therefore I will take that into account for my June Income Report. Want to see more income reports? Linqia has been a consistent part of my blogging income for a few months now. In May I received compensation for Time Management Tips for Bloggers & Those Working From Home, a post I created for TP-Link as well as my post about Zevia, a stevia-based soda. Bonus for me: TP-Link added my post to their website, so I get a small trickle of views from that. May was my best coaching month & I saw an increase in repeat clients! As a coach, I work with people one-on-one to better their blogs, their social media presence, & their brands. This is a really fulfilling part of my business. Learn more about my coaching & how it could help you! I wrote Self-Care Essentials to Bring to a Camping Music Festival, a sponsored post with Cetaphil, back in early March. It kept getting delayed until late May when we finally we were given the go-ahead to post. I received advanced reimbursement for an upcoming trip & sponsored post. June's Income Report will see some additional expenses because I'll use the reimbursement for products, food, gas money, & experience purchases related to the post. I finally got paid from a Facebook & Twitter post from 90 days ago for the OREO MILKA Chocolate Candy Bar. Yum. A 90 day wait for payment is one of the longest I've encountered. As I mentioned earlier in this post, Linqia has been a consistent part of my blogging income over the course of multiple months. I've included it on my Blogging Income Reports, so some people sign up. I receive $5 for anyone who's accepted into the Linqia network. Subscribe to my newsletter for exclusive blogging + social media tips! Congratulations Carmen! Seriously, this is awesome. I'm in my first month of blogging and it's always really inspiring to read posts like yours. I've been browsing around your blog for 10 minutes already and I love what I see! I find it so great that you share these types of things with your readers and I really find it fascinating! Blogging is definitely a learning curve and I know numbers aren't everything, but it's useful to get an idea of how things could be running! And huge congrats on your progress! It must be great to read older posts and look at how much progress you and your blog are making!! These are always really interesting to see. Thank you for sharing! :) And congrats for hitting $1000! Congratulations of reaching $1200 - when did you start earning money off your blog? Do you remember the size of your following at this point? Hi, this is fantastic. I have not seen any one else share this info. Well done on your first 1,000. I have just started blogging and this is so good to see. What is a average view on your blogging site per day? Congrats on reaching $1,000!! I've never heard of Linqia before so you've inspired me to check it out and look for other sponsors! Congratulations, this is really great! I hope to be there soon! I have been quite apprehnsive about approaching brands myself and trying to network and build my brand presence but I don't know what I am scared of! I really need to muster the courage and get out there but I don't know where to start! Great job! So cool that you offer coaching services in addition to all the other monetization options for bloggers- I think the key is to diversify and it looks like you've really got a good grasp on that. That's awesome, girl! Blogging is hard work and earning a living from it is even harder. Great results for May. Looking forward to June! Great job! I make most of my income from ads. It's nice to get paid for all the hard work! This is so exciting to see! I'm still having trouble learning all the ins and outs of the blogging world ... I hope to make some income from it in the near future! Congrats! Congrats on your success! Thanks for sharing this super personal part of blogging. It definitely serves as inspiration for all us newbies out there! Congrats! That is amazing. I think it's so great you are sharing your blogging income with us! I just started my blog so obviously I'm not making as much a dime yet but I'm really hoping I'll eventually be able to make just a little money as I'm putting a lot of work into it. Do you by any chance have any tips for how to actually start making just a little bit of money or start collaborating with brands? Have a lovely Sunday, sweetie! That is so great! Congrats on your repeat coaching clients. I hope June is just as successful. that's great, keep it up and hope this month is as abundant for you! Congratulations on your success! Hope you have a wonderful July! Congratulations, this is giving me hope I am planning to get into sponsored posts this few months hopefully all works out. Wishing you success. Wow, congrats! This is truly inspiring. All the best! This is very insightful. I had no idea it worked this way. Congrats to you for the dedication to your craft. Great job on the coaching I'm looking to get into that as well for my blog & book publishing! Congrats on all your success thus far ! Keep it up! Wow well done on a great May! I can't wait until I hit the $1,000 mark, too! I love reading income reports because I always feel so inspired and encouraged! Congrats on your success - you're doing great! !